How exactly do you make science funny? This hands-on workshop will explore the underlying mechanisms of joke writing and science communication and how they overlap. You'll hear from award-winning comedians, journalists, a scientist, and a science cartoonist who work to make their performances, podcasts, videos, articles, and presentations engaging and funny. Then you'lll get the chance to practice by reading a press release or hearing a lecture and identifying funny angles for a story in breakout groups. Whether you're a writer, videographer, scientist, or non-science person who just wants to have a better conversation at family dinners, you will leave with a better understanding of what it takes to be funny from a scientific and comedic perspective. You can take this knowledge and continue practicing it in your work or life beyond this workshop. Most importantly, you'll learn that humor stems from creativity. While this workshop is targeted in producing humorous products, you should leave with a different perspective on how to be creative. Breakfast and coffee will be served starting at 9:30am. Bring your best medium for brainstorming whether that be a laptop or pencil and paper. This workshop is made possible by funding from the National Association of Science Writers. Additional support is provided by the D.C. Science Writers Association. But wait, there's more...Join us for Science Comedy night! 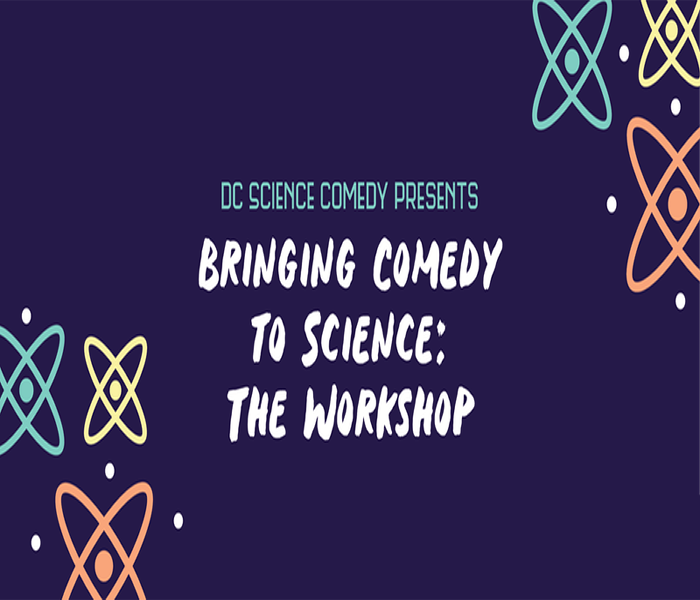 On Sunday, May 20th at 7:30pm, our panelist Dhaya Lakshminarayanan, a comedienne from San Francisco, will be headling science comedy at the DC Improv: DC Science Comedy: Dhaya Lakshminarayanan (May 20). Join us for a night of science-themed stand-up! If you buy the package for both events now, you will receive a discount! Bring your best medium for brainstorming whether that be a laptop or pencil and paper. Breakfast (yogurt, bagels, fruit, bread, and select breakfast sandwiches) will be served along with coffee. There will be gluten free and vegan options. No, we live in the 21st century! A mobile ticket is fine. The DC Drafthouse entrance is on L Street Between 13th and 14th Street (1100 13th St NW, Washington, DC 20005).